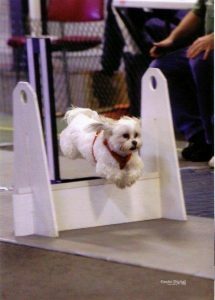 Flyball Practices are on Friday evenings at 7:15 pm. The team is welcoming & open to helping new members learn this great sport. 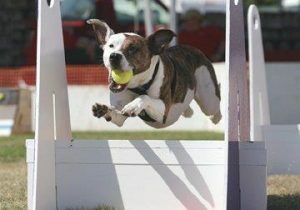 Flyball is a team sport for dogs developed in the late 1970s. It consists of a starting line, four hurdles, and a special spring-loaded box at the end of the hurdles that contains a tennis ball. The first dog runs over the hurdles, hits the box, catches the balls, and returns over the hurdles to where the next dog will take off. There are four dogs on a team and they race against another team in a lane next to them. Attending Flyball practice at The Puppy Perfectors will introduce you and your dog to this fun, fast-paced sport. You will learn all the fundamentals that are required. Practices are drop-in style, $10 per practice attended. 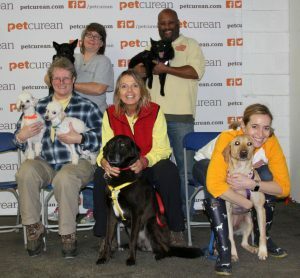 Once you and your dog learn the basics, there is an opportunity to join the team and participate in tournaments. Absolutely no aggressive dogs can be allowed and basic obedience is very helpful. Please contact us before attending for your first time.